Initial draft. Outline of content and draft text for sections 2,3 and 4. Updates to sections 2 and 3 following comments received during the project team meeting on February 17. Updates to 3.1. Updates and new text added to section 4. New text added for section 5. Updates following comments received during the project team meeting on March 3. Updates following comments received during the project team meeting on March 10. Restructured and updated content based on comments received. Added new section 10. Updates following comments received during the project team meeting on April 7. Updates following comments received during and in between project team meetings. Updates following comments received during project team meeting on June 2. Final version approved by Bits as basis for PoC. Updated based on comments from PoC. Besides some minor editorial corrections, the following issues has been addressed in this version: 7, 8, 17, 20, 22, 23, 24 and 31. Issue 18 related to ref . Reference removed. Bi-weekly collaboration meeting decides to elevate version 0.95 to version 1.0.0. This section lists documents referred to in the Rulebook. The convention used throughout is to provide the reference number only, in square brackets. Use of square brackets throughout is exclusively for this purpose. A component providing access to the PEPPOL eDelivery network. The basic communication protocol used in the PEPPOL eDelivery network. The logical business content being exchanged between two business partners. Represented in an ISO 20022-based financial message. The physical data-file moving “on the wire”. An ISO standard for electronic data interchange between financial institutions. A non-profit international association under Belgian law (AISBL). Provides overall governance for the PEPPOL eDelivery network. In this document: An organization using the Enhanced PEPPOL eDelivery network to send and receive Business Documents. In OpenPEPPOL Transport Infrastructure Agreement: An organization, Contracting Authority or Economic Operator, using the PEPPOL Transport Infrastructure for exchange of Business Documents. A central component of the PEPPOL eDelivery network providing information on where to find information about a given PEPPOL Participant (registry). A distributed component of the PEPPOL eDelivery network providing detailed information about the receive capabilities for a given PEPPOL Participant (repository). The keywords “shall”, “should” and “may” are used as described in . The keywords “comply” and “conform” are used as described in . It is expected that 3-4 versions of a specification will be available for use by the market at any given point in time. Phase in: date at which the new/updated element is introduced as an optional element. Transition: the date at which the new/updated element replaces the current element as the mandatory element. The previously mandatory element becomes optional. Phase out: the date after which the old element is no longer supported in the PEPPOL network. The Norwegian banks are in the process of implementing ISO 20022-based messages for handling of payments, such as payment instructions from customers or notifications sent to customers. This development implies an introduction of ISO 20022-based massages in the bank-customer interface and a gradual phase-out of the currently established formats. As part of this implementation there have also been a growing recognition for improvements to the communication infrastructures used. It is recognised that any future communication infrastructure used in the bank-customer interface need to build upon infrastructures and standards commonly accepted in the market and provide the technical and legal security required for this type of business transactions. The PEPPOL eDelivery network, currently used by some 90.000 private and public entities being serviced by more than 50 access points and exchanging more than 35 million business documents in 2016, represents such an infrastructure. The vision of this initiative is to introduce an enhanced version of the PEPPOL eDelivery network as the common solution for transport of ISO 20022-based financial messages. 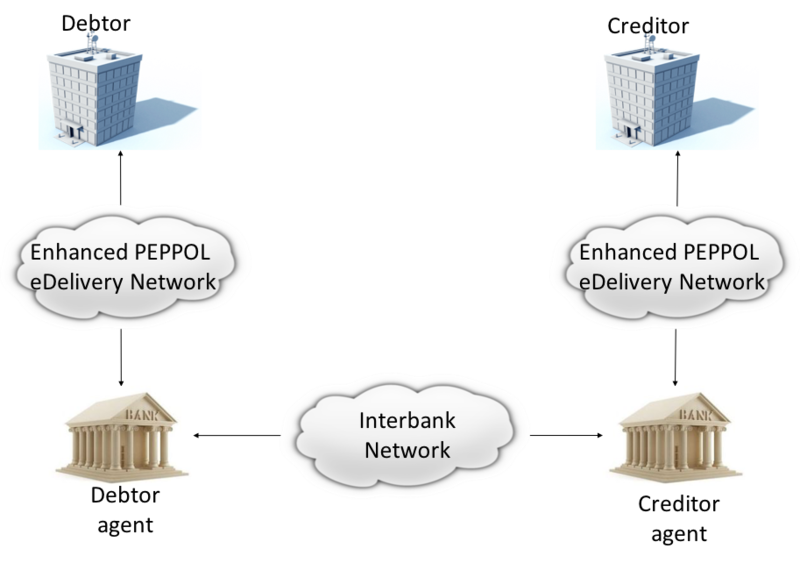 A customer using the Enhanced PEPPOL eDelivery network can switch bank without making changes to its technical infrastructure. A customer using the Enhanced PEPPOL eDelivery network can change PEPPOL access point provider without having to make changes to its business application. The Enhanced PEPPOL eDelivery for secure file transfer of ISO 20022-based financial messages can be used by all private and public entities in the Norwegian market without any changes or additions. The Enhanced PEPPOL eDelivery for secure file transfer of ISO 20022-based financial messages can be used outside Norway without any changes or additions. This rulebook and its associated standards and specifications can be sent to an external software developer who can build a solution which is interoperable with other existing solutions. Readers understands the rulebook and find all information they need in the rulebook, its attachments and referred documents. The objective of this rulebook is to identify and describe the rules, principles and requirements, for the use of the Enhanced PEPPOL eDelivery for transport of ISO 20022-based financial messages between the banks and their customers in the Norwegian market. To achieve this the rulebook makes extensive use of references to technical specifications providing the detailed normative technical content as illustrated below. Although this rulebook is aimed at the Norwegian market, it is expected that the technical rules, principles and requirements expressed could be applied also in other markets and application domains. The actual use and content of the ISO 20022-based financial messages will however be constrained to the Norwegian market. banks and their customers registered as receivers of ISO 20022-based messages in a PEPPOL SMP or acting as sender of such messages. Any party claiming compliance to the rules, principles and requirements identified and described in this document may implement additional features in their solutions provided that these additional features do not violate or contradict the rules, principles and requirements described. the existence of legally binding agreements between the actors and the principle content of such agreements, but will not provide the actual legal text of the agreements. This does however not prevent all or parts of this document to be relevant also for other use cases, such as interbank communications. The below figure serves to illustrate the scope of this document. The business level is focused on the business agreement and use of file-based payment services (e.g. general payments, salary, etc.) between the customer and its bank. The business agreement should state that the parties will use Enhanced PEPPOL eDelivery, their responsibilities for connecting to an accredited PEPPOL Access Point as well as registration of the business documents they may receive in a PEPPOL SMP. The Application level is focused on the use of ISO 20022-based financial messages, identification of the specifications relevant for the payment process (including what messages to use when, and how to handle errors and exceptions, the syntax to use and what information to place where in the files), identification of the requirements for securing the messages and service limitations (e.g. max. file size, timeouts, etc.) and the requirements for secured transfer of files between the bank, customer and their PEPPOL access points. The messaging and transport level is focused on the agreements and technical specifications for how to interface and interact with the Enhanced PEPPOL eDelivery network as well as the services and service levels to be observed by the actors involved in this infrastructure. The final set of agreements governing the use of the Enhanced PEPPOL eDelivery solution for transport of ISO 20022-based financial messages shall be positioned as an Application Domain Agreement and be in conformance to the results from the on-going revision of the OpenPEPPOL Transport Infrastructure Agreement. From a business level view point, the actors involved in the exchange of ISO 20022-based financial messages are the banks and their customers. Depending on the side of a financial transactions, these actors may take different roles as illustrated in Figure 2. Figure 2. The business level four-corner model. The payment services used by a debtor or the reconciliation services used by a creditor are typically provided by an ERP solution provider. Either by providing the basic ERP and payment/reconciliation functionality for installation on the debtor/creditor own hardware or by offering this functionality as a cloud service. In any case the ERP solution provider is in no way involved in the business transactions and has no direct responsibility for the actual business content of the ISO 20022-based messages being exchanged. It is the responsibility of the debtor/creditor to ensure that the payment/reconciliation services it applies comply to the rules, principles and requirements as stated in this document as well as any applicable legal requirements. The ERP solution provider may have a written statement of conformance to applicable rules and specifications outlined in this rulebook. Especially in larger organisations the use of a shared service centre is becoming increasingly common. A shared service centre may handle payments on behalf of several legal entities. A shared service centre will typically operate the actual payment/reconciliation services and as such handle the data on behalf of their clients. It is the responsibility of the debtor/creditor to ensure that any entity acting on its behalf comply to the rules, principles and requirements as stated in this document as well as any applicable legal requirements. The shared service centre may have a written statement of conformance to applicable rules and specifications outlined in this rulebook. The banks will also frequently make use of third party service provider to do parts of the processing. Such third-party service provider is in no way involved in the business transactions and has no direct responsibility for the actual business content of the ISO 20022-based messages being exchanged. It is the responsibility of the bank to ensure that the services it applies comply to the rules, principles and requirements as stated in this document as well as any applicable legal requirements. The actors and roles involved at the application level are the same as those at the business level as illustrated in Figure 2 above. These roles will exchange ISO 20022-based financial messages as identified in the below table defined in  depending on the business scenario implemented as the agreement between the bank and its customers. Following the approval of a received claim for payment (e.g. an invoice), the Debtor will initiate a credit transfer to the Creditors account and be advised on the debits made as basis for reconciliation of Accounts Payable. The Debtor may request that previous payment initiations not yet processed, can be cancelled. Following the approval of salary payments and other compensations in an HR-system, the Debtor will initiate a credit transfer and be advised on the debits made as basis for reconciliation of Accounts Payable. The Debtor may request that a previous salary payment initiations not yet processed, to be cancelled. Based on an established mandate, the Creditor will do a direct debit on the Debtor’s account and be advised on credits received as basis for reconciliation of Accounts Receivables. Based on an agreement between the Creditor and Debtor, the Creditor will establish a direct debit mandate with the banks to authorise the use of direct debit. The Debtor/Creditor will receive a periodic notification from its agent about debits/credits made to its account for reconciliation of general ledger and decision-/liquidity-systems. The Debtor/Creditor will receive a periodic statement from its agent about transactions made to its account for reconciliation of general ledger and decision-/liquidity-systems. The Debtor/Creditor will receive a periodic report from its agent about transactions made on its account for reconciliation of general ledger and decision-/liquidity-systems. To support the implementation of these business scenarios in the Enhanced PEPPOL eDelivery network, a set of unique process and document identifiers has been developed and are available from . 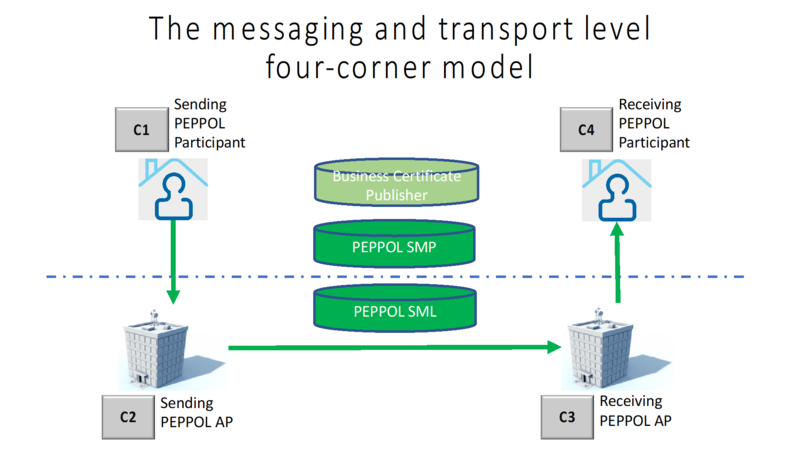 The PEPPOL eDelivery network is a combination of a four-corner message exchange model, discovery model (capability look-up), a PKI-based security model and a legal framework that enables the exchange of structured information through the internet, wrapped in a messaging envelope. The PEPPOL eDelivery network, as currently used for e.g. electronic invoicing, was established to ensure secure and reliable messaging between PEPPOL Access Point services. To provide support for end-to-end security and reliable messaging required for the exchange of financial messages, as well as for electronic communication by the public procurement directives, an enhanced version of the PEPPOL eDelivery network has been established. 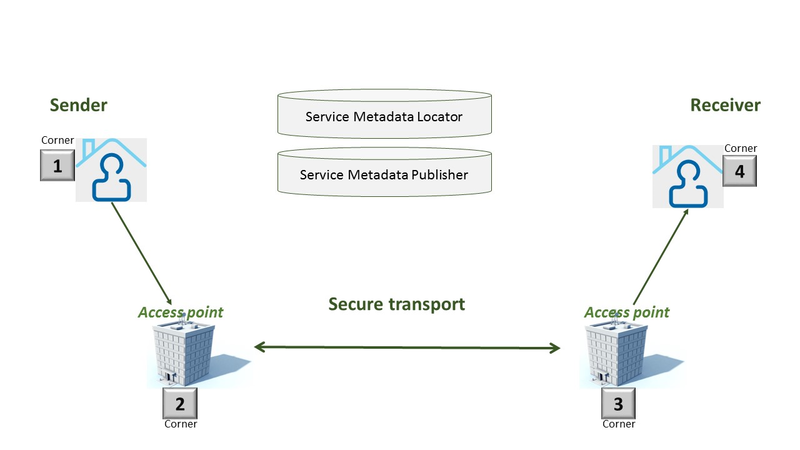 In the four-corner model, the back-end systems of end-users do not exchange data directly with each other, but transport data through Access Points. These Access Points (PEPPOL AP) are conformant to the same technical specifications and are therefore capable of communicating with each other. 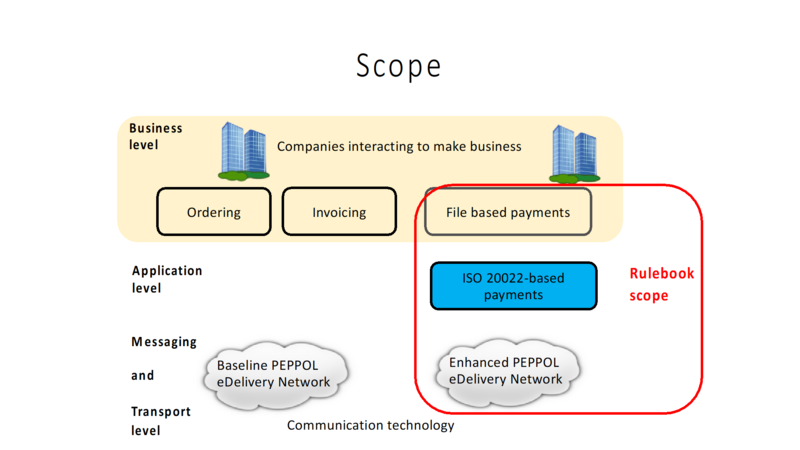 From a transport domain viewpoint, the actors involved in the exchange of ISO 20022-based financial messages are the sender and receiver of an ISO 20022-based financial message and their respective PEPPOL AP Providers as illustrated in Figure 3. Figure 3. The messaging and transport level four-corner model. A private or public entity using the Enhanced PEPPOL eDelivery network to send or receive Business Documents (i.e. an ISO 20022-based financial message). A PEPPOL Participant can act in any of the business roles identified in point 4 above. 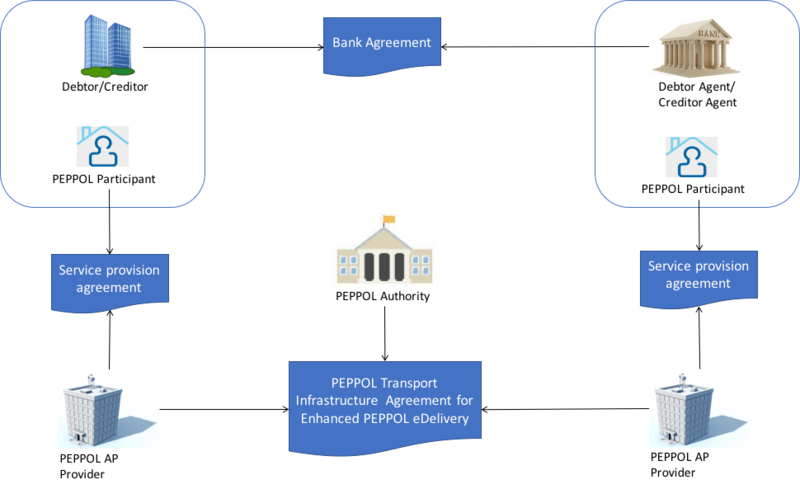 An organization providing PEPPOL Access Point services as part of the PEPPOL Transport Infrastructure and thereby giving a PEPPOL Participant access to the PEPPOL eDelivery network. The PEPPOL SMP service is a repository of information about PEPPOL Participants and their capabilities to receive ISO 20022-based financial messages, as well as the PEPPOL AP Provider used. ELMA is the centralised SMP service used In the Norwegian market provided by Difi. The PEPPOL SML service is a centralised component of the PEPPOL eDelivery network functioning as a registry of PEPPOL Participants and the SMP in which further information may be found. The PEPPOL SML is provided under contract by the EC unit DG DIGIT. The Business Certificate Publisher is a component introduced for the Enhanced PEPPOL eDelivery network to store and make available qualified certificate upon lookup. In the first phase, the Business Certificate Publisher will be hosted by DIFI as a central component. In the future, the PEPPOL SMP will be used to locate a PEPPOL Participants published certificate. Each PEPPOL Participant using the Enhanced PEPPOL eDelivery network need to be registered in a PEPPOL SMP. The PEPPOL SMP is a service, or a repository, containing information about the identity of the PEPPOL Participant (the PEPPOL Participant ID), the type of financial messages it can receive (receive capabilities) and the PEPPOL AP to which the messages should be delivered. The actual registration in the SMP will be done by the PEPPOL AP Provider. The PEPPOL AP Provider shall register receive capabilities in an SMP for all PEPPOL Participants it services. As there is a close relationship and dependency in the use of ISO 20022-based financial messages in the different business processes as described in section 5 above, the SMP provider need to ensure that the PEPPOL Participants are registered with a formally issued PEPPOL Participant ID and a correct and consistent set of receive capabilities. The provider of PEPPOL SMP services for ISO 20022-based financial messages shall have procedures in place to ensure that PEPPOL Participants are identified by an identifier that enables verification of the PEPPOL Participant as a legally established entity. The provider of PEPPOL SMP services for ISO 20022-based financial messages shall have functionality implemented to ensure that PEPPOL Participants are registered with a correct and consistent set of receive capabilities as per . A PEPPOL Participant, i.e. a sender or receiver of ISO 20022-based financial messages, will utilise a PEPPOL AP service to gain access to the Enhanced PEPPOL eDelivery Network. The provider of such services, the PEPPOL AP Provider, can be compared to the mailman in a traditional physical mail system. Analogue to this it follows that the PEPPOL AP Provider does not have any responsibility for the content inside of the envelope being handled. Due to the introduction of end-to-end security in the Enhanced PEPPOL eDelivery network, the PEPPOL AP Provider is not even capable of reading or processing the payload within the envelope. On the other hand, there is a requirement on the PEPPOL AP Providers participating in the Enhanced PEPPOL eDelivery network to offer services and service levels conformant to the stated requirements in . This include a requirement on the PEPPOL AP provider to maintain an internal register of addresses suitable for routing of received messages and acknowledgements to the correct Debtor/Creditor. A PEPPOL AP Provider offering services in the Enhanced PEPPOL eDelivery network shall have its services accredited as conformant to the SLA requirements for providers of PEPPOL Access Points services in the Enhanced PEPPOL eDelivery network . The role of the Business Certificate Publisher  is to store and make available qualified certificate upon lookup for a receiver who wishes to receive encrypted documents. This makes it possible to introduce end-to-end security. The service can retrieve qualified certificates when a valid combination of participant identifier and business process identifier are used for the lookup. Business processes are used to separate areas like payments and invoicing. The Business Certificate Publisher thus fulfils the role as a qualified certificate publisher for secure messaging. The provider of Business Certificate Publisher services for ISO 20022-based financial messages shall have procedures in place to ensure that PEPPOL Participants are identified by an identifier that enables verification of the PEPPOL Participant as a legally established entity. The provider of Business Certificate Publisher services for ISO 20022-based financial messages shall have procedures in place to ensure that only certificates issued by a qualified certificate issuer are used. 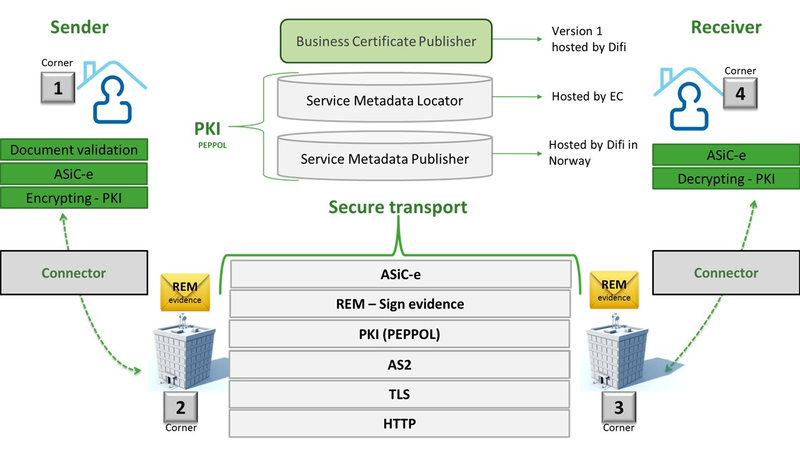 The Business Certificate Publisher can be realized as either a centralised or a distributed component in the enhanced PEPPOL eDelivery network, where PEPPOL Participants will have access to store their public keys used within a business process. In the future, it is expected that the SMP will be used to locate an organization’s published certificate, and thus facilitate a decentralised use. A key aspect of business level security is to ensure that an individual or legal entity is authorized to execute a given operation, such as debiting an account for a certain amount. the use of a two-step approval process where the payment transaction is finally approved in the internet banking system. In this case the authorization is done in the internet banking system. or by use of bank certificates issued by or on behalf of the bank. In this case the payment transaction is signed with the bank certificate and this signature is forwarder to the bank together with the payment transaction itself to achieve straight through processing. The use of trust anchor. The document defines requirements to be observed by all actors involved in the process. PEPPOL Participants and PEPPOL AP Providers shall ensure that the services they implement and operate are in conformance to the security requireents defined in . The provider of the Business Certificate Pubiser service shall ensure that the services they implement and operate are in conformance to the security requireents defined in . Validation is used to ensure that the content of a message is technically correct and complies to its governing specification(s). This is typically done by validating an XML instance document against its governing XML Schema and/or by running a set of schematron rules to validate the actual content. The PEPPOL Participant acting in the role as sender of an ISO 20022-based financial messages shall ensure that the content of the ISO 20022-based financial message is compliant to the appropriate specification in . The PEPPOL Participant acting in the role as receiver of an ISO 20022-based financial messages may validate that the content of the ISO 20022-based financial message is compliant to the appropriate specification in . If the receiver of an ISO 20022-based financial messages detects errors during validation or processing it shall advise the sender accordingly by return of an error message as specified in . The sending PEPPOL AP provider offering services in the Enhanced PEPPOL eDelivery network shall ensure that the file sent is compliant to all appropriate specification for the Enhanced PEPPOL eDelivery network. 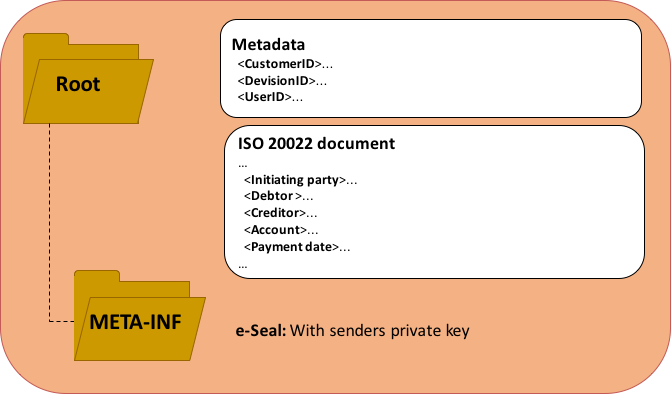 Before sending an ISO 20022-based financial message, the XML-file need to be prepared and packaged into an appropriate envelope format. The sender of an ISO 20022-based financial messages shall ensure that the message is packaged for transmission in compliance to . To facilitate routing of the envelope between PEPPOL APs, even after its content is encrypted, there is also a need to carry the basic addressing information and information on the type of data carried in the envelope outside of the actual financial message itself. This is typically done using some form of a header that carries data about the business transaction carried in the envelope. The sender of an ISO 20022-based financial messages shall ensure that the required addressing information is available in compliance to . To facilitate internal routing and correct processing of the business transaction by the receiver, there is also a need to carry some metadata about the customer relationship between the bank and its customer outside of the actual ISO 20022-based financial message. The sender of an ISO 20022-based financial messages shall ensure that the required metadata-file is available in compliance to . An audit trail is a chronological record, or set of records, that provide documentary evidence of the sequence of activities that have affected a message. In a process involving several actors and roles, an audit trail can be established by collecting acknowledgements generated at different steps in the process. PEPPOL AP Providers offering services in the Enhanced PEPPOL eDelivery network shall log all PEPPOL Business Documents/payloads that they send or receive. PEPPOL AP Providers offering services in the Enhanced PEPPOL eDelivery network shall implement procedures to follow-up and initialte investigation if acknowledgments are not received. In case of non-delivery, the PEPPOL AP Provider shall informn the PEPPOL Participant. The PEPPOL AP Provider shall not do a re-send of messages. In addition to the logging, which primarely is done for operational purposes, the acotrors are required to generate and store secure evidence of the documents exchanged. PEPPOL AP Providers offering services in the Enhanced PEPPOL eDelivery network shall generate and store REM evidence in compliance to  for the PEPPOL Business Documents/payloads they handle. The PEPPOL eDelivery network as currently used for e.g. electronic invoicing, is a profile of the European Commission Connecting Europe Facility (CEF) eDelivery Digital Service Infrastructure (DSI), or a PEPPOL eDelivery for short. To provide support for end-to-end security and reliable messaging, as well as increased service levels, required for electronic communication by the public procurement directives, an enhanced version of the PEPPOL eDelivery network has been established. The specifications for this enhanced version of the PEPPOL eDeiivery network were developed and tested as part of the e-SENS project as well as by Difi, and are expected to become a part of the PEPPOL eDelivery network specifications. The main features of the Enhanced PEPPOL eDelivery network is that it supports a higher level of security, including encryption of documents and the ability to track and trace all messages sent throughout the network. The Enhanced PEPPOL eDelivery network is built by combining a set of standardised building blocks, some of which are available as open source software. The process of combining the components is elaborated in . A short description of the different components (building blocks) of the Enhanced eDelivery network is given in the following sub-sections. The SML is a standard component of the well-established PEPPOL eDelivery network , who’s role is to manage the resource records of the participants and the SMPs (Service Metadata Publishers) in the DNS (Domain Name System). The SML is the only centralised component in the PEPPOL eDelivery network, and is currently operated by the EC unit DG DIGIT. The Enhanced PEPPOL eDelivery network implies no changes to the PEPPOL SML service. The SMP is a standard component of the well-established PEPPOL eDelivery network , who’s role is to provide information about the receive capabilities of the PEPPOL Participants and the PEPPOL APs they use. The SMP is a distributed component in the PEPPOL eDelivery network. The Business Certificate Publisher  is a new component introduced with the Enhanced PEPPOL eDelivery network. The role of the Business Certificate Publisher (Certificate server) is to store the public key of a the encryption certificate for a receiver who wishes to receive encrypted documents. This makes it possible to introduce end-to-end security. The service offers retrieval of the public key when a valid combination of participant identifiers and business process are used for the lookup. Figure 6. Key information elements exposed by the Business Certificate Publisher. The ASiC-E (Associated Signature Containers – Extended) is a new component introduced with the Enhanced PEPPOL eDelivery network. ASiC-E is a file format to package data of various types into a zip-folder (the ASiC-E archive). Each ASiC-E archive can have payload (e.g. an ISO 2022-based financial message), additional information or metadata associated with it that can be protected by a signature. The profile of ASiC-E as implemented in the Enhanced PEPPOL eDelivery network is defined in the technical specification provided by the e-Sense project . In the Enhanced PEPPOL eDelivery network two instances of ASiC-E are used. The inner ASiC-E archive contains the actual business document and its associated metadata file, e.g. a pain.001- message and the metadata file placed in the root folder and the electronic seal of the sender is placed in the META-INF folder to prove integrity. Figure 7. Content of inner ASiC-E archive. The outer ASiC-E archive contains the encrypted version of the inner ASiC. Figure 8. Content of outer ASiC-E archive. The purpose of using the two ASiC containers is to exploit the rate of compression of the payload and attachments in an ASiC-E archive. Encrypting documents before compression will result in the compression rate to be much lower. For encryption of the actual ISO 20022-based financial message the hybrid encryption approach is applied as outlined in  using the encryption certificate assigned to the sending PEPPOL Participant. The Standard Business Document (SBD) and Standard Business Document Header (SDBH) are standard component of the well-established PEPPOL eDelivery network . The function of the SBD is to provide an envelope around the data to be transported over the PEPPOL eDelivery network. The function of the SBDH is to carry routing information about the actual business document contained in the transmission. Document Routing information is captured in the 'Sender' and 'Receiver' data structures of the SBD/SBDH and it is used to identify the PEPPOL Participant acting in the roles as sender and receiver using PPID as unique identifiers. Document Identification information is captured in the 'DocumentIdentification' data structure of the SBD/SBDH. It is used to identify the specification to which the actual business document content enclosed inside the SBD complies. This information may be used by the sender and recipient to identify and route the message to the appropriate business application without having to open the business document payload. Document Processing Context is captured in the 'BusinessScope' data structure of the SBD/SBDH. It is used to provide parameters for processing the business document in the context of a business process supported. The payload represents the actual business document, or more precisely the outer ASiC container in the Enhanced PEPOL eDelivery network. The metadata file is a new component introduced with the Enhanced PEPPOL eDelivery network. The function of the metadata file is to carry additional information about the ISO 20022-based financial message carried in the payload to facilitate correct internal routing and processing by the receiving PEPPOL Participants. The identity of the user authorised to issue an ISO 20022-based Financial message on behalf of the Debtor/Creditor. The Enhanced PEPPOL eDelivery network introduces some enhanced and new requirements for the use of acknowledgments and exception reporting to support the requirements for reliability and full traceability of the message exchange. As responsibility for processing is transferred from one role to another, the actor performing a given role is required to generate and forward an acknowledgment to the preceding role as illustrated in Figure 10. Figure 9. Use of confirmation message (RC4) and exception report (RC4b). The receiving PEPPOL AP will generate and return an MDN (Message Delivery Notification) to the sending PEPPOL AP. The receiving PEPPOL Participant will generate and return an confirmation message (known as RC4 ) to confirm that the transmission is received before starting un-packing and processing of the ASiC-E archive. If any exceptions are detected during the un-packaging and processing of the ASiC-E archive, such as errors related to signature validation or decryption, an exception report (known as RC4b ) is created and returned to the Sending PEPPOL Participant. The Reception Acknowledgment Message  and Handling Exception Message  are new components introduced with the Enhanced PEPPOL eDelivery network. Due to network configuration and priorities, the sending PEPPOL Participant may in some cases receive an RC4b (exception report) before the corresponding RC4 (acknowledgment). The sequence in which these two messages are received shall not be considered significant. There is a requirement on the PEPPOL AP providers offering services in the Enhanced PEPPOL eDelivery network to make all received acknowledgments and exception reports available to the PEPPOL Participant. The actual content and structure of how this is done is however left for the PEPPOL AP provider and PEPPOL Participant to agree. Even though there are obligations on each actor to follow-up and initiate investigation if acknowledgments or exception reports are not received, it is the ultimately the Sending PEPPOL Participant who shall ensure that appropriate responses ate received. The MDN is a standard component of the well-established PEPPOL eDelivery network  used to provide an acknowledgment on messages exchanged between PEPPOL APs. To meet the increased requirements for security and trust required for exchange of financial messages, an enhanced version of the MDN will be used in the Enhanced PEPPOL eDelivery network. Use of SHA-512 for creation of MIC of both transmission and response according to RFC3851 point 3.4.3.2. Added MDN field “Date” defined by IANA using formatting according to RFC822 point 5 as described in RFC3798 point 3.3. As the exchange of financial messages requires secure evidence of the message exchange, the Enhanced PEPPOL eDelivery network uses a part of REM (Registered Electronic Mail) standardized by ETSI. By combining the building blocks described above, secure end-to-end messaging is achieved. A short description of the process of combining the components is given below and further elaborated in . The technical details of this process may also be found at . Figure 10 below illustrates how the results of the different certificates are carried in the ASiC-E archives. The inner ASiC-E archive may carry one or more signatures resulting from applying the Bank Certificate to the content of the ISO 20022-based financial message. The purpose of these signatures is to authenticate the business transition in case of straight through processing. The inner ASiC-E archive shall carry the electronic seal generated by applying the signing certificate issued to the sending PEPPOL Participant on the ISO 20022-based financial message. 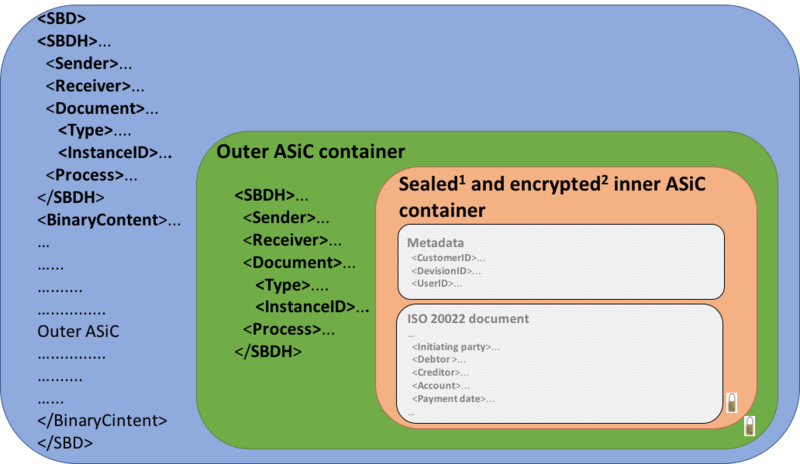 The outer ASiC-E archive shall carry the encryption certificate use to encrypt the inner ASiC-E archive as well as the electronic seal generated by applying the signing certificate issued to the sending PEPPOL Participant on the encrypted content. The components (building blocks) of the Enhanced eDelivery network are implemented as open source components or made available as part of commercially available software products. The most significant open source components available to realise the functions needed for a sending or receiving PEPPOL Participant or PEPPOL AP Provider are described in the following sub-sections. Oxalis is an open source implementation of a PEPPOL access point according to the specifications used by OpenPEPPOL. The project focuses on handling of messages in a secure manner. The project itself contains only those interfaces required by the specifications and interfaces needed to extend existing solutions with PEPPOL transmission capabilities or to create new services part of PEPPOL network. The project is written in Java. As from version 4.0 Oxalis provides full support for the Enhanced PEPPOL eDelivery network. SRest, also known as Ringo, is a REST interface for administration and handling of messages to be sent into and received from the PEPPOL eDelivery network. This project streamlines the interfaces between the sending PEPPOL participant and its PEPPOL AP provider as well as between the receiving PEPPOL AP provider and the receiving PEPPOL Participant, to allow for easier switching between services providers. This project is initiated by Difi based on feedback from the marked requesting standardization of more aspects related to OpenPEPPOL. This project may be utilized for one or more of the above building blocks. For instance, an implementation may use this project to implement generation of the SBDH. The figure below gives an over view of the contractual relationships assumed to be present between the different actors/roles. In the role as Debtor/Creditor a business entity will have an agreement with its bank acting in the role as Debtor/Creditor Agent. The bank agreement will provide governance for the business relationship between the two actors, including provisions for the actual use of the relevant ISO 20022-based messages. The customer shall have a signed contract with its bank regarding the use of file based payments services. In the role as PEPPOL Participant the business entity, as well as the bank, will have an agreement with a PEPPOL AP Provider. The business entity and the bank may make use of the same or different PEPPOL AP Providers. A PEPPOL Participant shall have a signed contract with its PEPPOL AP Provider. This service provision agreement will govern the details related to the services offered by the PEPPOL AP Provider and how the PEPPOL AP service is connected to the internal ICT infrastructure of the PEPPOL Participant. The detailed content of this agreement is left for the parties to define. The PEPPOL Agreement Framework for Enhanced PEPPOL eDelivery is a multilateral agreement between PEPPOL AP Providers for provision of Enhanced PEPPOL eDelivery services. The purpose of this agreement is secure a minimum set of common services and service levels. A PEPPOL AP Provider offering services for transport of ISO 20022-based financial messages in the Enhanced PEPPOL eDelivery network shall have a PEPPOL eDelivery Agreement signed with the appropriate PEPPOL Authority. In real life, there may be a range of combination of actors involved in the handling of financial messages. As an example, the business entity initiating a payment transaction may operate all functions internally, i.e. operating its own PEPPOL AP service connected to the Enhanced PEPPOL eDelivery network. In such a scenario, there is a very clear and direct line of communication between the business entity and his bank where the business entity has full operational control for all aspects of the process. who is connected to a commercial PEPPOL AP Provider offered by yet another organisation. Even in this most complex scenario, it is the PEPPOL Participant identified as the sender or receiver of a message that is ultimately responsible for the complete process. As a matter of principle, the internal complexity of how the IT infrastructure is organised should not be of concern to other actors. The Shared Service Centre, ERP solution provider and PEPPOL AP Provider are all acting on behalf of the PEPPOL Participant. Figure 11. Service providers acting on behalf of the PEPPOL Participant. A PEPPOL Participant shall ensure that signed contracts exist for all third-party services provided on its behalf. A PEPPOL Participant shall ensure that service providers acting on its behalf has access to sufficient information (e.g. internal routing information and certificates) allowing them to fulfil their obligations as expected. As is noted above, it is the PEPPOL Participant identified as the sender or receiver of a message that is ultimately responsible for the complete process. This implies that the legal responsibility is transferred somewhere between the sender and receiver. A term frequently used in legislation is “come to the knowledge of”, which in general terms can be interpreted as “the receiver of some information is bound by that information as soon as it enters its domain of responsibility”. Based on this understanding the European Commission has provided a ruling stating that “an electronic message is received as soon as the last byte is received by the recipient’s access point”. It follows from this that the PEPPOL Participant has responsibility for all service providers acting on its behalf. A PEPPOL Participant shall ensure secure and reliable processing of information within its domain of responsibility. Figure 12. Transfer of legal responsibility. The following sub-sections describes some common use-cases and how they affect the distribution of roles between the actors involved. In this use case a business entity is using an internal accounting function/department to process its accounting, including all its payments. The business entity has a business agreement with its bank for use of ISO 20022-based financial messages for straight through processing. It also has an agreement with a PEPPOL AP provider (AP1) giving access to the Enhanced PEPPOL eDelivery network. Table 1. Registration in ELMA for the “Using an internal accounting function” use case. Table 2. Registration in BCP for the “Using an internal accounting function” use case. In this use case a business entity is using an internal accounting function/department to process its accounting, including all its payments. The business entity is not aiming for straight through processing of payments, but employs a two-step approval process where the payment transaction is approved in the internet banking system. Also in this case, the business entity need to have a business agreement with its bank for use of ISO 20022-based financial messages. The Bank Agreement also need to make it clear that final approval of the payment transaction takes place in the internet banking system. The business entity will also have an agreement with a PEPPOL AP provider (AP1) giving access to the Enhanced PEPPOL eDelivery network. The registrations needed in a PEPPOL SMP and the Business Certificate Publisher to support this use case are the same as for the previous use case. In this use case a business entity is using a Shared Service Centre (SSC) to process its accounting, including all its payments, where the SSC is authorized to make payments on behalf of the Debtor. The business entity has a Bank Agreement for use of ISO 20022-based financial messages for straight through processing authorising the SSC to debit its account. This implies that the SSC will be identified as an initiating party within the ISO 20022-based financial message. In this use case, it is either the business entity or the SSC acting on behalf of the business entity who is identified as the PEPPOL Participant. Who is allocated the role as PEPPOL Participant depends on the agreement between the business entity and the bank. In this use case a business entity is using a Shared Service Centre (SSC) to process its accounting, including all its payments, where the SSC is preparing the payment transactions but they are not authorized to make payments on behalf of the business entity. Instead a two-step approval process where the payment transaction is finally approved in the internet banking system is applied. Also in this use case the business entity need to have a business agreement with its bank for use of ISO 20022-based financial messages. The Bank Agreement also need to make it clear that final approval of the payment transaction takes place in the internet banking system. As the SSC is preparing the actual ISO 20022-based financial message, the SSC will be identified as an initiating party. Again, it is either the business entity or the SSC acting on behalf of the business entity who is identified as the PEPPOL Participant. Who is allocated the role as PEPPOL Participant depends on the agreement between the business entity and the bank. 1. The PEPPOL SMP service used in the Norwegian market is known as ELMA. 2. Within the Norwegian SMP, ELMA, the legal company identifier (“organisasjonsnumer”) will be used as PEPPOL Participant identifier. 3. Within the Norwegian SMP, ELMA, the legal company identifier (“organisasjonsnumer”) will be used as PEPPOL Participant identifier. 4. The first version of Business Certificate Publisher service will be hosted by Difi as a centralised service. 5. In the Norwegian market the “organisasjonsnummer” (Norwegian legal identity number) is used for this purpose. 6. In case of straight through processing the Inner ASiC-E archive will also carry the signature generated by applying the Bank certificate. 7. Difi acts as a PEPPOL Authority within the country of Norway, and has furthermore been assigned as PEPPOL Authority for the payment business domain. 8. Difi acts as a PEPPOL Authority within the country of Norway, and has furthermore been assigned as PEPPOL Authority for the payment business domain.